PELION - Pelion peninsula is one of the few regions in Greece where you can easily combine a mountain and beach vacation. According to Greek Mythology Mount Pelion was the home of the Centaurs. Pelio has 24 picturesque villages, most of these villages, including Vyzitsa, look the same as they did centuries ago. Built in the unique traditional architecture and tucked away amongst lush green woods. PLASTIRAS - Lake Plastiras is the ideal destination for those who look for a vacation surrounded by nature. The countryside around Plastiras lake is perfect for a number of activities such as walking along pathways and through forests, cross-country cycling, canoeing on the lake, horse riding. Those who enjoy the off-road rides by jeeps or enduro bikes, will experience unforgettable moments. 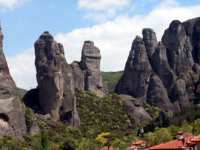 METEORA and KALAMBAKA - The natural sandstone rock towers of Meteora were first used to build the first monastery atop one of the rock formations back in the 10th century. Since then 23 more monasteries were build atop these rock formations. Meteora is a unique place in the world and it is not to be missed on your travels to Greece.